Today it is my stop on the Summer at Skylark Farm tour and Heidi has got a delicious recipe for us. Hello everyone and thank you so much for joining us on this leg of the blog tour with the fabulous Rea. You are certainly in for a sweet treat! No Summer at Skylark Farm inspired picnic would be complete without the inclusion of apples on the menu so here’s a recipe for healthy apple crisps to snack on that simply couldn’t be easier to follow. What to do: Heat the oven to 140C / 120 fan Slice the apples through the core into thin slices. A mandolin is perfect for producing wafer thin slices but please watch your fingers! Arrange the slices in a single layer on a baking tray lined with parchment and dust lightly with cinnamon if required Cook for between 45 and 55 minutes until the apples have completely dried out and are light golden in colour. The key is not to rush them. You all know by now that I love the simple things in life and this healthy apple snack really couldn’t be any easier to make. Wishing you all a summer of bunting festooned, sun filled days and sumptuous Skylark Farm inspired picnics! Thank you for this tasty recipe Heidi, I am looking forward to trying it out! 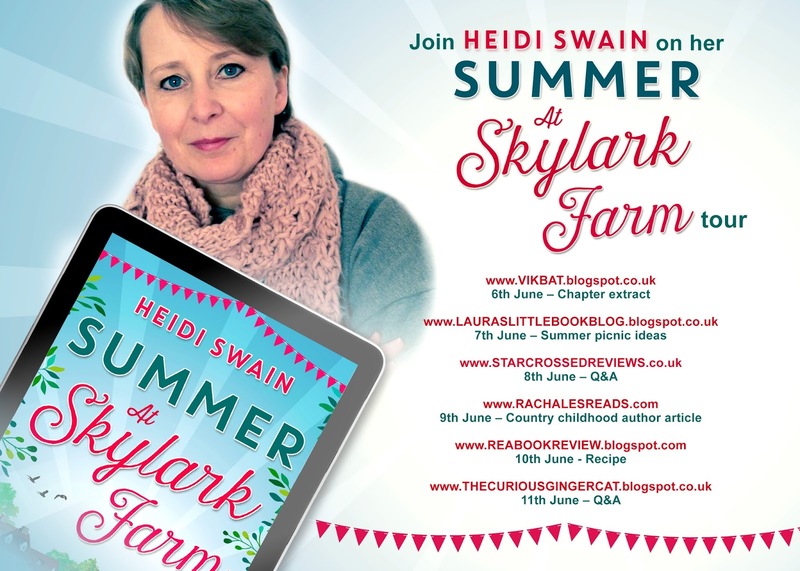 Summer at Skylark Farm is the second ebook by Heidi Swain, her debut The Cherry Tree Cafe was an enjoyable read so I was looking forward to reading her latest release to see how her writing had progressed. Amber has reached a point in her life where her career has overtaken her life and now at the top of her game she is exhausted and on a whim decides to leave her job behind and embark on a new journey. Working on Skylark Farm was never something she envisaged doing but she is determined to work on her relationship with Jake whose heart lies with Skylark farm. But can the farm catch her heart too? I loved the setting and the friendships that developed between Amber, Harriet and Jessica. I did find Holly's part in the book a little predictable so I would love to see the author be able to keep a little suspense in her next book. Summer at Skylark Farm definitely surpasses Heidi Swain's debut and her writing has blossomed, I look forward to her next release and I would love to see the author write a Christmas novel maybe even with Amber and Jake making an appearance to see how things progress for them as I don't feel like their story has finished.